Thanks SO much for the updates, Ombugge. Shame to see her apparently underused. Any progress with the Drew factor? Wonder how she would fare with a chug all the way to New Orleans, and then on a round-world adventure? Is she up to it? Nice to see you are checking in once in a Paul. I haven't been across to KK or Labuan for a while now, but I have not heard of any changes. The thing about burning no facile fuel while travelling the world is just a pipe dream yet. There have been a couple of other enquirers, but I don't get any answer from the Owner side. Hope you can join us more often to keep a tap on other threads that used to interest you. Will do, Ombugge. Life was difficult last year re health of family members, so many things took a back seat. Brother Barry still around, currently interested in antique collecting and Boer War memorabilia. Father Dennis 'Smoky Stoker' (HMS Killham) has various health issues but still around (88 in two weeks' time). Self, currently writing young people's novels and seeking a publisher prepared to take them on. Very glad to see several stalwarts are keeping the site alive. Came across these two images and wanted to share them with all of you. The second image is from an old company-book. Thanks for the link to the Shipspotting site, Jan-Olav. She is looking pristine. Any news on progress of her sale? A lot of "being there"-feeling. I loved the film because of several reasons: well made, rare film, and the old Norge Rundt studio. Hi, all. Just wanting to keep this thread alive. 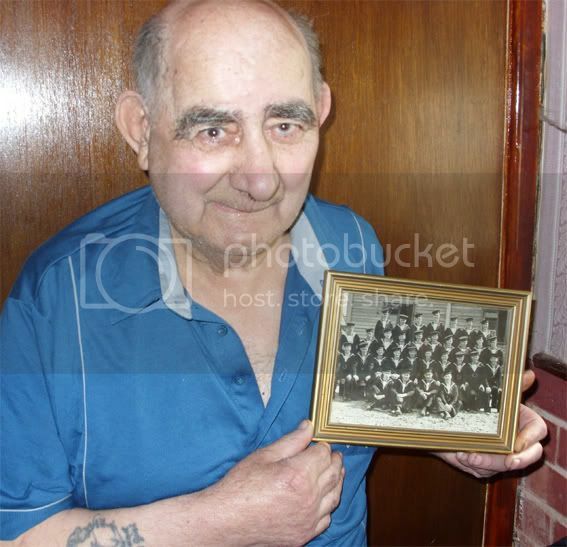 Our father, Dennis, or Smokey Stover from the days of HIS Kilham, is now 89 and is currently in hospital. Is there any current news on the ship's sale? Hello all. I am unfortunately the bearer of sad news. See page 10 of this thread. Perhaps the last survivor of this delightful ship when in its guise as HMS Kilham, our father, Dennis Smoky Stover Cobb, died today in a local hospital after a long and heartbreaking illness. I would have loved him to have been reunited with the old girl just one more time before he died, but that was never going to be. I cannot think of a more suitable and fitting site to pay tribute to his life than on this fantastic thread. I had printed off all pages of the topic for him and he had been fascinated. I cannot thank Jan Olav enough for providing the opportunity to do this. Regards to all. Paul, I am so sorry, please accept my deepest sympathy. The loss of a parent is a big break with the past that one never quite gets over. It is good that your father had some comfort in seeing the pages you printed out for him, which must have helped him get enjoyment out of reliving his memories. Thank you so much for your kind words, Ivy. It means a lot at a time when emotions are in a turmoil. Heartfelt condolences Paul at this difficult time. Thank you all.. Have 're-read the thread myself. 89 years old, an age to be proud of. I hope his last months were not too painful. It was so good to see, that this forum was "the spot" for such a lot of memories and information about "his" ship, which also meant a lot to so many other people. All the best to you all! Whenever such a loss happens, it is a hard task to get things sorted out and accept that life goes on, having (again) more proud memories in mind. Ralf: thank you for your message. Noting you are from Stuttgart and my father's reminiscences are all from his time during The Second World War (albeit that he fortunately didn't see any action), I find your message even more poignant, magnanimous, and a superb example of reconciliation that should serve as a shining example to conflict everywhere. Knowing WWII experiences from my grand-parents (my parents were to young to remember) and the odyssey, which parts of my family had to make after the war i learned that it is never an option to solve a conflict with a war. Growing up in a divided country, we still felt this every day. And now we celebrated the 25th anniversary of the reunion and last week-end we were together with some dear friends from the former "other part". We are so happy to have this annual meeting (report will follow soon). I was also a great opportunity this year to show Ivy the Gemany of today. I invite you to follow our thread in the crew member chapter. So again, thank you for your kind words! It is a confirmation to walk on the right path. And that is a good feeling.